Trailer Park Paradise: Really, now? There is this odd little New Age thing where white folks have the greatest respect for Native Americans (noble savages, of course). They don't quite seem to get it, though. And this postcard is emblematic of that problem. Seriously, look at it. 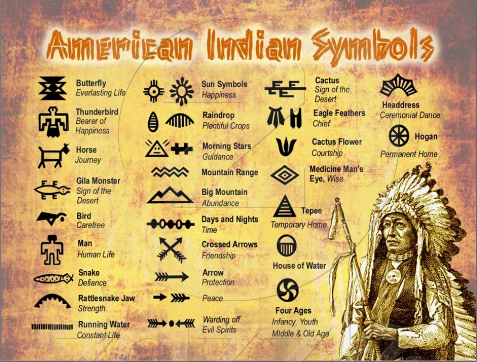 Native American Symbols. Because, of course, Native Americans are all one homogenous culture, right? Well, Native Americans might be, but American Indians not so much. A Cherokee and a Diné (probably known to you as Navajo) would not have very much in common when it comes to either culture or language. The United States is pretty freaking huge, and the Internet wasn't exactly a thing three or four hundred years ago. Honestly, I find the whole thing pretty offensive. I'm not going to demand that the government force people to stop this sort of thing, but it's a sort of cultural ignorance that will really make me think less of a person. I don't expect anyone to not say Navajo or realize that the Chippewa are really supposed to be called Ojibwe (or that Kiowa may well be the Sioux word for crazy, and at any rate isn't what the Ka'igwu traditionally call themselves (though I think they've given up on that)), but is not mashing together multiple cultures, languages, and religions really too much to ask? Or is it okay since they mean well? Cultural appropriation is hard work, people. Can't really expect folks to do their homework. By and large the same folks who think that all Native Americans are the same are the same ones who think that Hispanic is an appropriate term for another huge variety of cultures, and they'll be among the first to tell you they're the sensitive ones. In the end, the term you choose to use (as an Indian or non-Indian) is your own personal choice. Very few Indians that I know care either way. The recommended method is to refer to a person by their tribe, if that information is known. The reason is that the Native peoples of North America are incredibly diverse. It would be like referring both a Romanian and an Irishman as European. It's true that they are both from Europe but their people have very different histories, cultures, and languages. The same is true of Indians. The Cherokee are vastly different from the Lakota, the Dine, the Kiowa, and the Cree, but they are all labeled Native American. So whenever possible an Indian would prefer to be called a Cherokee or a Lakota or whichever tribe they belong to. This shows respect because not only are you sensitive to the fact that the terms Indian, American Indian, and Native American are an over simplification of a diverse ethnicity, but you also show that you listened when they told what tribe they belonged to. Of course, it also depends on a rather serious lack of understanding of American history--to wit, not every European settlement just came in and jacked land. Quite a few of them procured agreements from the local tribes to live where they did. And, of course, the tribes never fought amongst themselves for territory, right? They all lived in peaceful harmony 'fore those Evil White Men came along. 100% agreement with you. I've been around a lot of Indians, and none of them likes the term "Native American". And they are definitely all different, and some get along better with other tribes, but there are some who are traditional enemies and still have some bad blood remaining. People who lump them all together are clueless. 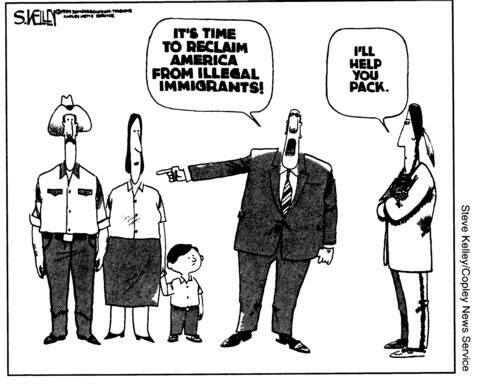 I've seen that editorial cartoon on FB too, and I commented there too, asking how long do a people have to live somewhere before being considered "native"? One generation, two, ten? I suppose I could just repatriate myself to "Europe", as I'm mixed Czech, German, English, Irish, Welsh, and Scot, but there's no one country for me...pity those "old Countries" don't allow instant citizenship for someone born somewhere else, after their ancestors left generations ago. Even the "Native Americans" migrated here, following the herds across the land bridge from Asia, if you go back far enough! Most Indian tribes' names for themselves translates as "the people" or something similar. There are some who say the word Sioux comes from a derogatory name used by another tribe. And speaking of tribes fighting amongst themselves, I know that the Navajo and Hopi still have problems here in the 21st century. And of course it is ridiculous to act as if the various tribes' beliefs are the same or even similar. There are/were hundreds of different tribes all over the Americas and they didn't all come from the same parts of Asia all those millenia ago, much less have the same language or religion. Semi-related, when I read or hear British news I am occasionally jarred to remember their "Asian" means "Eastern Mediterranean through India" rather than "China, Japan, Korea[s], or 'south of China.'"